Calculate the commuter pass charge. You can assign the commuter pass to only railway. ※ The request example is written in Japanese, but if Japanese is included in the request parameter, please encode URL (percent encoding) of the Japanese part with UTF 8. 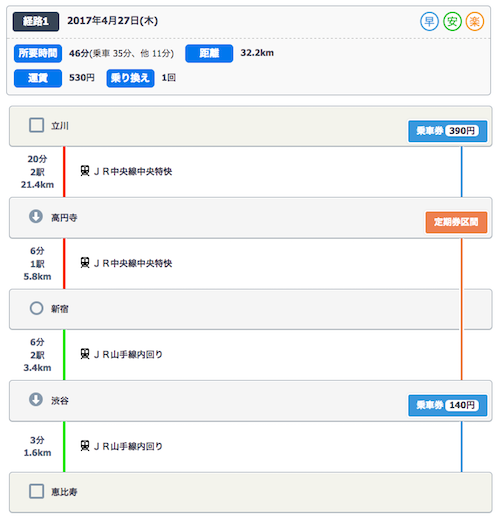 Create the commuter pass route string which is a colon-separated string such as 高円寺:ＪＲ中央線快速:Up:新宿:ＪＲ山手線内回り:Down:渋谷 by combining strings obtained by station name ResultSet/Course/Route/Point/Station/Name , average rail ResultSet/Course/Route/Line/Name and the direction of average rail ResultSet/Course/Route/Line/direction . This string will be used for the parameter of assignDetailRoute at step 2. The specification of station name, average rail and the direction of average rail used in the commuter pass route string should be exact. It is possible that unexpected route would be assgined if you specify undefined string in station name or average rail, or you specify them in wrong order. ※ The request example is written in Japanese, but if Japanese is included in the request parameter, please encode URL (% encode) of the Japanese part with UTF 8. Although it is possible to go to Ebisu station from Shinjuku station by JR-Yamanote-Line without transfer, the section is separated at Shibuya station in the example response. You can determine whether the train extends or not by cheking the value of station state (ResultSet/Course/Route/Line/DepartureState/Type or ResultSet/Course/Route/Line/ArrivalState/Type). 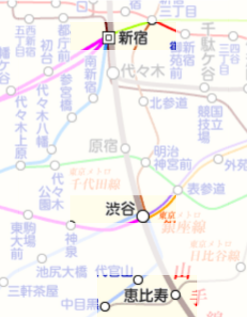 Both the values of ResultSet/Course/Route/Line/ArrivalState/Type at the section bitween Shinjuku station and Shibuya station, and at the section bitween Shibuya station are extension . Which means that the train only pass the Shibuya station and it does not need to transfer. AssignRoute parameter can also be used for calculate cummuter pass charge, but it is possible that the opposite direction of some loop lines are deducted from fee. Therfore, to keep exactness of the route, we recommend to use the assignDetailRoute parameter which can consider the direction of line.